Fairly close to Fort Fisher, there are some rocks (coquina) that jut out into the Atlantic. I never asked Dad if he knew how long they had been exposed, but they were one of my favorite places to surf fish for trout and bluefish in the fall. There were times when I gigged flounder with Uncle Crawford Lewis in the same location. 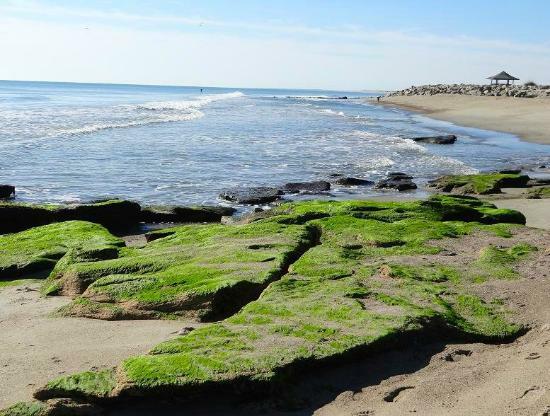 About half a mile to a mile out to sea from these rocks, there were a number of the blockade-runner wrecks that sank, leading up to the final siege of Fort Fisher in early 1865. The powder vessel is also in this area. One of Dad’s favorite activities was taking summer guests (men only) out to fish over these wrecks. Now, this was not for the faint of heart, although it was truly an adventure. You see, Dad’s choice of boats for these trips was about 12 foot in length, really no more than a small rowboat. I was allowed to sit in the bow and the one guest would sit in the stern. Dad would sit in the middle and do the rowing. Now, the trick would be to row across the bar and wait for the breakers to come to a lull, and then Dad would head to sea before the next wave broke on the bar. Then he would row out to the wreck and we would fish. Dad’s GPS system for locating these spots was pretty basic. He would line up the Fort Fisher Monument and the Kure Beach water tank. 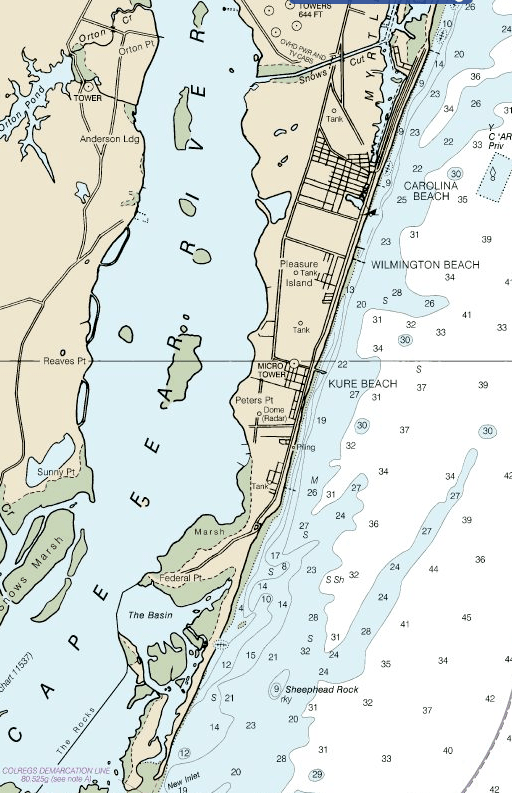 On one of the wrecks farther out he would line up the Monument and the Breakers Hotel at Wilmington Beach (current location of the ‘Sea Colony’ at Ocean Blvd. and 421 in Carolina Beach). Fishing in a small boat in the open Atlantic was sometimes more than our guest’s stomach could manage. It was not unusual for our guest to lose his breakfast. Uncle Bubba Roebuck, (LTJG “Buck” Roebuck), liked to join us on these adventures, but I think he always got sick. Our fishing tackle was low-tech. We used a drop lines with only a couple of hooks and a sinker. No fancy tackle! Our boat anchor was also not high-tech. Dad would put some bricks in a burlap sack. After we had caught enough fish for dinner, we would prepare to head toward shore. He would remove the bricks from the sack, put the fish in the sack, tie a cork to the rope and then tie the rope to the boat. All this just in case we turned over crossing the breakers. The return from one of these fishing adventures was also quite a trick. Dad would sit just outside the breakers until he decided which wave to follow into shore. Catching the wave was something like the technique used in surfboarding. 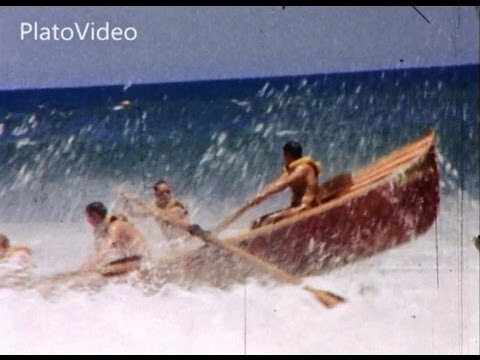 The only difference being that you rode the crest on the backside of the wave and maintained your position by rowing forward to stay up or place your oars deep in the water to create drag so you do not go over the crest of the wave. I can tell you that when the waves are big, doing this will get your heart rate up, a real adrenaline rush! The men in the Hewett-Lewis family were skilled boatmen dating back to their whaling days. Footnote on our boat: I am sure there were boats that I do not remember, but the boat I remember well was built somewhere around 1948-1950. I watched Dad build it in the garage. It was made of cypress and was a lapstreak with a “V” bow. After the stem, keel, ribs and stern board were in place, the sides were installed. The bottom and bench were the last to be put into place. The boat had a great shape and was easy to get into the water. 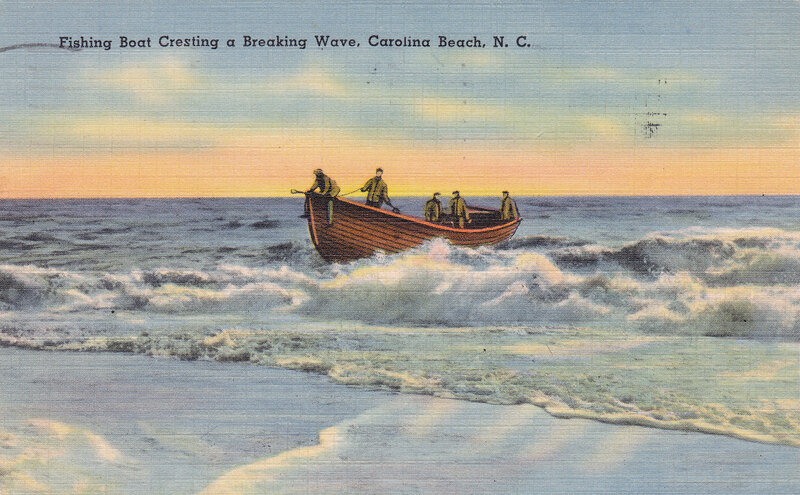 In the early 1950s, I was allowed to take it by myself and go out beyond the breakers to fish. At that time I learned the technique of crossing the bar and riding a wave on the return trip. 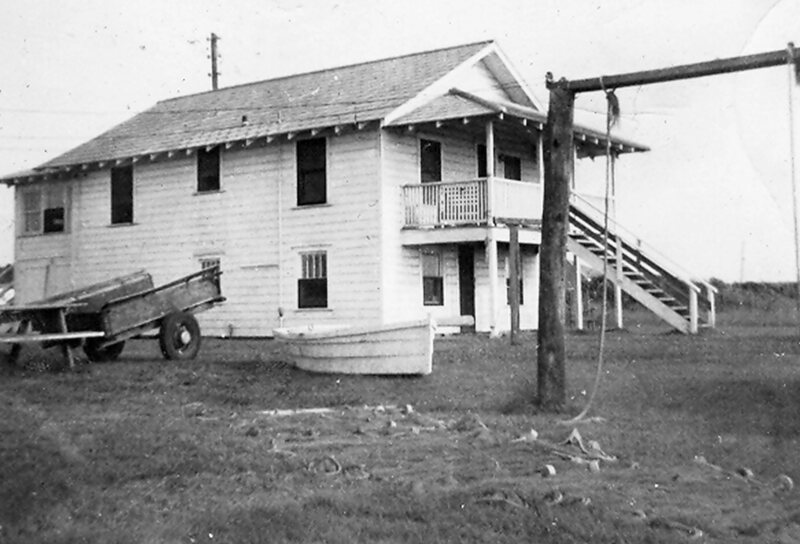 This photo is the Hewett’s family home, one block north of the Fort Fisher Gate, and the boat in the foreground was the one used in most of our fishing trips.